Seb Jones from the Speyside brewery who is delivering pianos to pubs along with his beer. 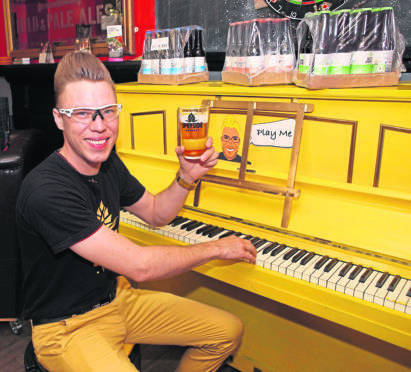 He is more used to delivering beer to pubs, but now brewer Seb Jones hopes supplying pianos will also strike a chord with punters. With bar trade waning following stricter drink-drive laws, the 31-year-old wants to attract people back to their local to enjoy a traditional pub sing-along. Mr Jones has now started refurbishing unwanted pianos, then offering them free to local bars. He has now installed his first piano in the Red Lion in Forres, and a string of other bars have also said they’d like one. The founder of Speyside Brewery said: “With pubs struggling a wee bit, we’re helping that community feel. “It’s obviously a traditional thing to have pianos in pubs but, over the last couple of decades people don’t have pianos in their homes any more. “The pianos we use are generally the out-of-tune, free-if-you-come-and-collect-it ones. Mr Jones, who plays piano himself, believes it is the first such scheme – which follows the popular street piano movement in cities such as Aberdeen and London. He said: “It’s part of a global movement. More than 1,890 street pianos have been installed in 60 cities across the globe, from London to New York, bearing the simple instruction to ‘Play Me, I’m Yours’. “Located on streets, in public parks, markets and train stations the pianos are available for everyone to play and enjoy. “I thought we could bring it to a local level and put pianos in pubs, where they always had a natural home in the past. Carrie Custodio, proprietor of the Red Lion in Forres, said the reaction had been generally positive so far.